Contributing artists include Harvey Bradley,Colin Burns, Christopher Clack, Ally Clarke, Valerie Dean, Jonathan Evens, Mark Lewis, Nadiya Pavliv-Tokarska, Janet Roberts, Caroline Richardson, Henry Shelton, Joy Rousell Stone and Peter Webb. Forest Philharmonic’s last concert of 2011 starts in romantic style with an orchestral suite from Tchaikovsky’s Sleeping Beauty. Sleeping Beauty was the composer’s biggest success on the stage, the first ballet that impresario Sergei Diaghilev ever saw and the ballet that introduced Rudolph Nureyev to European audiences. The orchestral suite captures the drama and the magic in full orchestral Tchaikovsky glory. Continuing our Best of British theme for the season, Elgar’s Nursery Suite evokes domestic scenes from Elgar’s own childhood memories with unmistakably English sounds. Czech patriotism made for London – Dvorak’s seventh symphony was commissioned by the London Philharmonic Society and received its world premiere in the capital to aclaim, We hope that Walthamstow will be similarly moved on 27th November. We are delighted to feature two of the orchestra’s professional principals in this concert, followed by Malcolm Arnold’s Fifth Symphony, romantic and Mahlerian in style. With Q&A with original cast member Muray Melvin and BFI fiction curator Jo Botting. There will also be an exhibition of original materials from the film and stage show in the cinema bar. 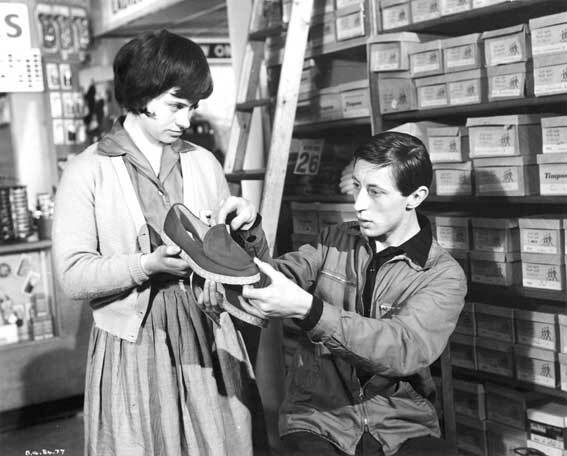 Join us for a very special screening of A TASTE OF HONEY(15) to celebrate the 50th anniversary of the release of a classic film from the British New Wave. Initially a play written by the then-18 year old Shelagh Delaney, it was first produced by Joan Littlewood’s Theatre Workshop and performed at Theatre Royal Stratford East, before being adapted into an award winning film. Set in the northwest of England in the 1950’s, A TASTE OF HONEY stars Rita Tushingham as Jo, a 17 year old working class girl from Salford. Neglected by her mother, she starts a relationship with a black sailor (Paul Danquah), but when he goes to sea she finds herself alone and pregnant and moves in with her gay friend, Geoffrey (Murray Melvin), who assumes the role of surrogate father. 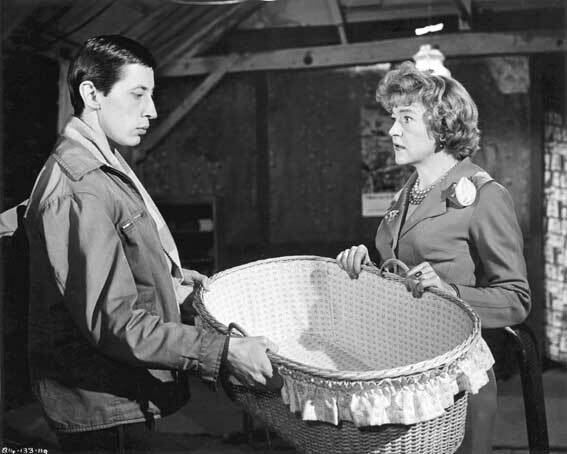 Groundbreaking in its day (the film was initially rated ‘X’), the film presents the taboos of mixed-race relationships, teenage pregnancy and unmarried mothers, and also went against the grain in foregrounding a strong female character. With a special introduction and post-screening Q&A with actor and archivist for the Theatre Royal Murray Melvin, and Jo Botting, curator with the BFI, this special screening is not to be missed. 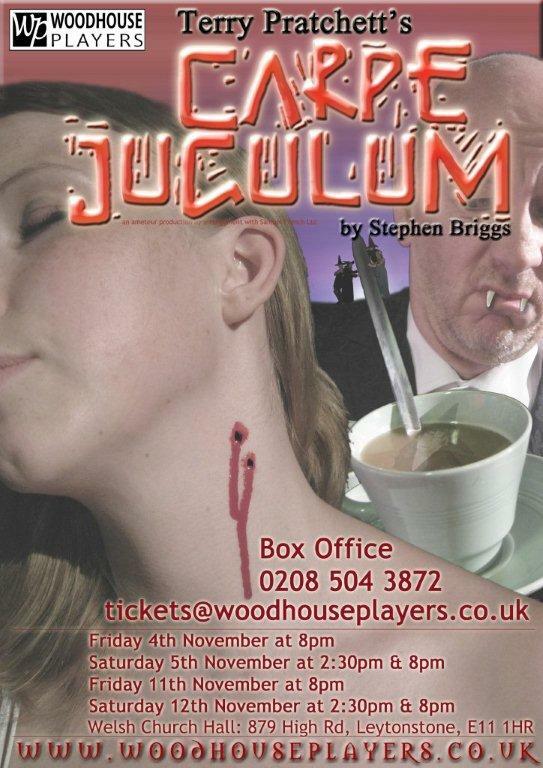 £6.50 for adults, £4.50 concessions, £ members. Call 0871 902 5740 or book online at http://www.picturehouses.co.uk/cinema/Stratford_London/film/A_Taste_Of_Honey . School groups can book tickets at £2.50 per student directly through the education department by emailing leah.b@picturehouses.co.uk or calling 07918745267. A dramatization of the 1968 strike at the Ford Dagenham car plant, where female workers walked out in protest against sexual discrimination. Their strike led to the 1970 Equal Pay Act. Starring Bob Hoskins, Sally Hawkins and Andrea Riseborough the film was nominated for four BAFTAs and was very well received by audiences and critics alike. Buy one ticket get the second half price! The Secret Garden is a timeless tale of a special place, where magic, hope and love grow. Troubled orphan Mary, her spoiled, sickly cousin Colin and kindly country boy Dickon discover that a world of caring can make a world of difference. Discover a whole world of magic in this wonderful movie. 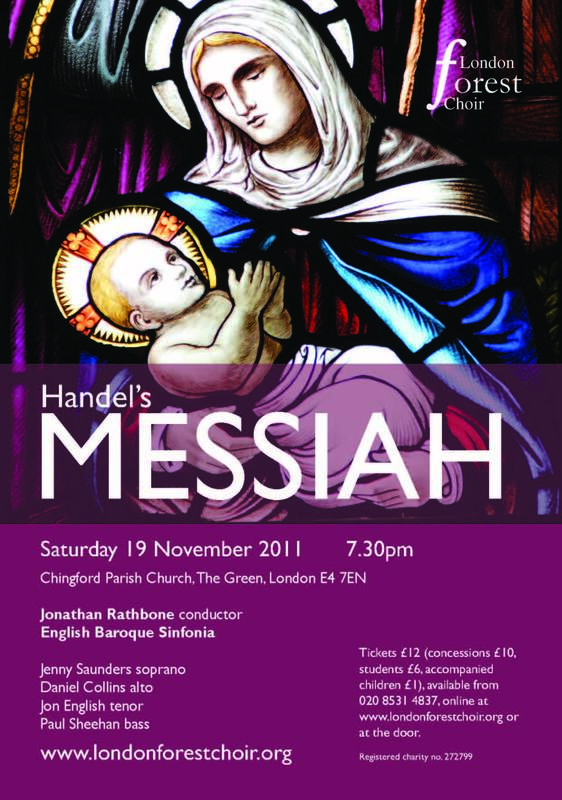 Tickets £5 child, £4 adults, under 2s free. What to do, when old traditions leave you vulnerable, and the youth of today are already so long in the tooth they are bored by both the old and the new? Count de Magpyr is redefining himself as a modern vampire, and he’s dragging his family of bloodsucking fiends with him. Meanwhile, in the neighbouring kingdom of Lancre, there’s a little princess’ naming ceremony to conduct and everyone’s invited… even the de Magpyrs. So as much as they love having guests for dinner, they enjoy it even more when there are new people dying to meet them. The vampires are, after all, such neo-Gothic trendsetters. Fortunately, the Witches of Lancre have also been invited to the feast (mostly) and they are solely interested in ale, handsome young men, and preserving the traditions where vampires are repelled through the light of religious faith, scalded by holy water, staked through the heart, decapitated, stuffed with garlic and roasted over a fresh pyre – until turned to ash. Sir Terry Prachett’s Discworld books have delighted and (in a subtle way) educated readers of all ages since 1983. If you saw our 2004 production of Wyrd Sisters, you can now catch up with the continuing adventures of Granny Weatherwax, Nanny Ogg and Queen Magrat of Lancre. But even if you didn’t see the earlier show, don’t miss this Witches vs. Vampires Halloween showdown of epic proportions! “The Guardian’s Guide Pick of the Clubs, Vintage Cabaraoke has hosted at one of Shoreditch’s Richmix’s Snapshots festivals as well as at the North South Divide at the Hemingway Vintage Festival 2011 at London’s South Bank Centre. 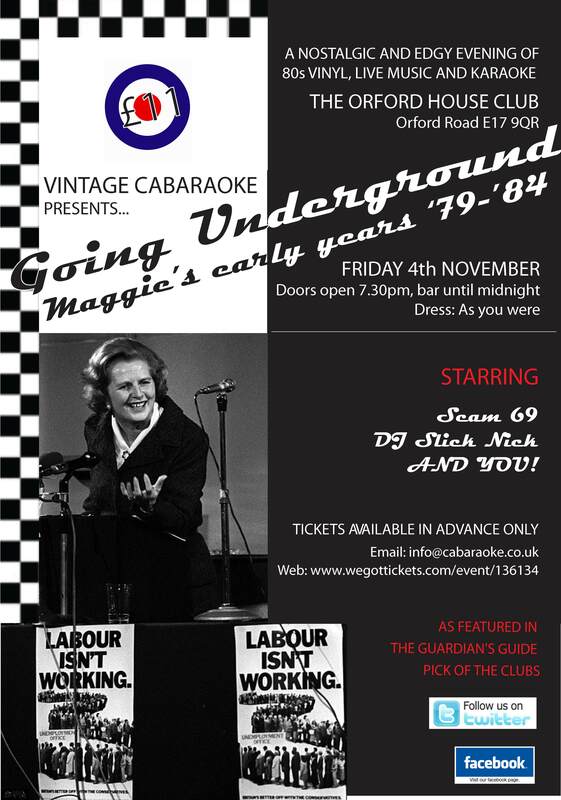 Recently featured on the Time Out London blog and in The Londonist’s recommended Cabaret section Vintage Cabaraoke is very pleased to announce that due to very high demand it has lined up another fabulous evening of entertainment taken from the era of Maggie Thatcher’s early years in power (1979 – 1984). SCAM 69 – four piece band who recreate the classics of their time; The Undertones, The Clash, Blondie and many more..
CLASSIC KARAOKE – all your favourite tracks from those years. SLICK NICK – your host and compere for the evening. Open to children aged 6-15 years, resident or attending a school in Waltham Forest. Entry is Free. Closing Date 30th November 2011. Entrants are required to draw, paint, or collage a picture of a fun Olympic sport for animals! You can show your animals competing in a real Olympic sport or create a new sport for them. Imagine Long-Jump for Kangaroos, frogs and fleas, animals racing, the elephant gymnastics team, weight-lifting ants, or lizards stretching their tongues to catch the furthest fly! A stunning tale of a new breed of cultural insugent: a punk genius who sparked a revolution and changed the face of human interaction for a generation, and perhaps forever. Shot through with emotional brutality and unexpected humour, this superbly crafted film chronicles the formation of Facebook and the battles over ownership that followed upon the website’s unfathomable success. With a complex, incisive screenplay by Aaron Sorkin and a brilliant cast including Jesse Eisenberg, Andrew Garfield and Justin Timberlake, The Social Network bears witness to the birth of an idea that rewove the fabric of society even as it unravelled the friendship of its creators. The Secret of Kells is a magical animated classic that tells the story of Brendan, a young monk whose life is changed forever when he is initiated into the secrets of the Book of Kells and embarks on an extraordinary adventure, meeting fearsome monsters, Vikings and a serpent god along the way. Nominated for an Academy Award for Best Animated Feature The Secret of Kells is a unique and stunning adventure for the whole family. Please note that there are three different ticket prices across both these screenings. Oxjam is Oxfam’s month-long music festival. It runs throughout October with hundreds of events around the UK and has so far raised £1.5 million for Oxfam. All proceeds from Oxjam Walthamstow go to Oxfam. Featuring a broad mix of live music from Indie, pop and soul to spoken word. Great music for a great cause! Ahead of an eleven night run of his solo show at Camden’s Roundhouse, the highly acclaimed PolarBear comes to Walthamstow. From the London Literature Festival, feature length spoken word pieces and regular appearances on BBC Radio 1, 3, 4 & 6, Steven Camden aka PolarBear plots a charming path between hip-hop and spoken word. The Melting Ice Caps – Tales of love, loss and betrayal courtesy of David Shah and his band. Reminiscent of the great English lyricists, Heaton, Tennant, Morrissey… able to craft intelligent, witty lyrics shot through with a slice of pop to embed them in your brain. The evening will be hosted by Akira The Don, who’ll also be playing. Originally signed to the giant Interscope Records, home of Bryan Adams and Dr.Dre, Akira has just released his second LP “The Life Equation”. It was produced by Stephen Hague, the man on the mixer for New Order, Blur, Robbie Williams, and The Pet Shop Boys. Finally Barbarossa aka James Mathe, a singer blessed with a gorgeous voice and a knack for tying lovely melodies to melancholic lo-fi electronics, he’ll be playing a stripped down set. His track “Stones” recently featured in the hit US Series “How I Met Your Mother“.